We recently looked at some great Hot Wheels cars that were inspired by actual cars that were umm… not that great. Today, we’re turning the tables on that. 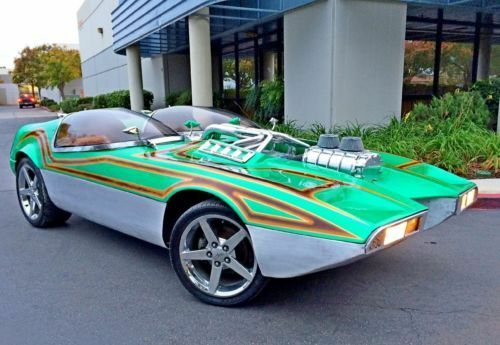 On several occasions, Hot Wheels has produced models that were so over-the-top awesome that they inspired someone to make a real-sized running version of that car. Let’s clarify that a bit… We’re talking about miniature vehicles made by Hot Wheels (which may have been inspired by an actual running production car or even a scale model kit from another company) that served as the template for someone to create a functioning full-size car based on that crazy model. Got all that? Good. Here they are, including the most authentic reproductions as well as ones requiring a bit of squinting and maybe a little suspension of disbelief to make them work. Possibly the most quintessentially perfect Hot Wheels design ever, the original Twin Mill has been reproduced in several scales from standard 1:64 to a 16-inch-long remote control car. But the most majestic Twin Mill is the real, running, full-size version produced by Mattel in the late 1990s. The car is faithfully scaled up from the original, but also features amazing new details like the flame-treaded tires and the twin hood-mounted tachs perfectly angled for the driver. The original Redline Deora was based on a Dodge concept pickup truck built from the cab-forward, mid engine A-100, so it doesn’t qualify for this list. But in the early 1990s, Chip Foose and company designed the Deora II, a modern take on that truck. The toy was popular enough that Mattel later commissioned a big version of this truck. While the design looks kind of dated a quarter century on, who wouldn’t find garage space for it? Flash forward to to the 21st century, when Hot Wheels introduced the Rip Rod, a fenderless 1930s baja coupe representing no specific brand of car… that is, until the folks at Ford decided a full size version of it would be a nice showcase for their latest EcoBoost engine technology. You’d drive the snot out of that thing, right? The Bone Shaker was another miniature design inspired by the rat rod movement, but not representing any particular prototype. Yet here we have a real version of the chopped, channeled pickup, complete with the skull-shaped grill shroud. As with the previous cars, Mattel authorized this jumbo version to trot out at trade shows. For many of us, bumper cars were the first time we got to really cut loose behind the wheel of a self-powered car, and one that was designed to crash into things at that! So, of course we love the Hot Wheels version. This street rod may or may have not been inspired by the miniature, but can we all agree it looks like it would be fun to drive into stuff? In honor of the latest “Star Wars” film, the folks at Hot Wheels created a series of model cars that captured the look and feel of several characters from that galaxy far, far away. The baddest one has to be the Darth Vader ride, which looks like the result if the Twin Mill mated with Vader’s helmet. So, yeah, of course they built a real one. And it is extremely bad. You can watch a video of it with Jay Leno, because, yeah, he’s Jay Leno. What, you don’t have this one in the blister? Well, the Custom ’39 Lincoln was first introduced as a 1:18 Hot Wheels model when the company dabbled in that scale. Even though it’s originally based on a production car, the real version considered here is a faithful reproduction of the model, including the slammed, bumperless body and the dazzling purple paint. The model was available in other schemes as well. This car made our previous list, becaue it’s a ridiculous scale model hot rod based on a puny micro car. But that ridiculous model became the inspiration for an accurately detailed, 1:1 ride by microcar collector Bruce Wiener from a spare Isetta shell that was sitting around his garage. It supposedly cranks at over 700 horsepower, which is about 695 more than the original bubble car. Whatta hoot! At some point in life (probably around age two, but for some of us, well into adulthood), we’ve all pretended that our shopping cart was a race car. So when Hot Wheels made a model of such a thing, it resonated deeply with a lot of people. Apparently deeply enough with a few grocery store chains (Schnucks, H-E-B, Save-Mart) who made their own giant show drag shopping carts, because we only live once, and we need to shop fast. Lastly, we have the latest generation of the Chevy Camaro. When Hot Wheels released a variant of this car in their proprietary shade of metallic blue, complete with flaming logos on the fenders, it was only natural that GM would copy the look for a 2013 special edition of their production car right down to the redlines and 5-spokes. As customs go, this one was pretty easy to execute. But of all the cars on the list, this is the only one you could actually buy if you weren’t Jay Leno. Now if we only had some giant orange track to run on! Can you think of any others to add to this list? Add them to the comments below! Remember, the Hot Wheels model had to come before the real car, not the other way around. The Red Baron would a awesome car to replicate! https://youtu.be/ghbspW67nrA. The Red Baron, Silhouette, Boot Hill Express, Deora, Engine 13, Sand Crab, Raiders Rader to name a few were all real. A couple years ago All the original Show Cars were at Autorama in Detroit Mi. I’ve seen video of the Rip Rod in the original red & black racing around on the dirt that looked a little different than the Ford version pictured. There is a winged Frog-type dune buggy and maybe more on the Hot Wheels web site or there abouts. I would love to have all of them, or at least take each of them for a spin! Great to see what a custom car builder can do. Upload an image (6MB max) (Allowed file types: jpg, gif, png, maximum file size: 6MB.